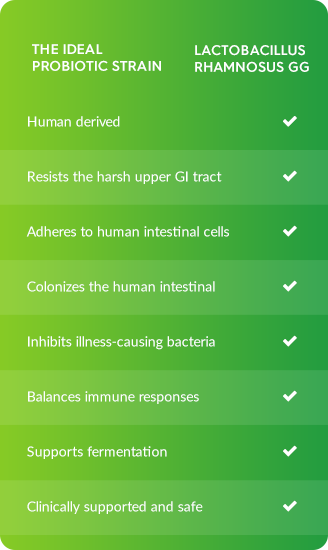 Mechanisms of action for LGG® include interference with enteropathogen colonization through competition as well as secretion of antibacterial substances, stimulation of bowel epithelial cell proliferation, and production of protective mucins.3,12-13 Physiologically, this translates into improved epithelial barrier function delivered by LGG®. The epithelial barrier is exposed to a broad spectrum of substances and organisms and is a critical control point for good health and appropriate immune responses. Taking together the hundreds of clinical trials in healthy and vulnerable populations including adults, children and infants, the totality of evidence indicates LGG® is both safe and effective. Potential benefits of a probiotic strain should be indicated at a given dose based on clinical studies. The clinical evidence for probiotics boasting high colony-forming units (CFUs) or multiple strains is largely unsupported. LGG® meets all requirements. Culturelle® certifies that our products meet the highest standards of purity and potency. Unlike some products which measure the number of probiotics cultures at the time of manufacture, Culturelle® guarantees the stated number of live naturally sourced LGG® cultures through the expiration date on the box. For a probiotic to provide optimal outcomes, it needs to survive and thrive. Each serving of Culturelle® probiotic is individually packaged and protected to ensure the survivability of our probiotic without the need for refrigeration. Capsules are individually sealed and given a mini atmosphere to prevent moisture, light, heat and air from getting in. This allows the product to be shelf-stable and require no refrigeration, while keeping our probiotic fresh and viable. Data on File. I-Health Inc, Cromwell, CT.
Mack DR, Michail S, Wei S, McDougall L, Hollingsworth MA. Probiotics inhibit enteropathogenic E. coli adherence in vitro by inducing intestinal mucingene expression. Am J Physiol Gastrointest Liver Physiol. 1999;276(4 39-4):G941-G950. Reunanen J, von Ossowski I, Hendrickx A, Palva A, de Vos W. Characterization of the SpaCBA pilus fibers in the probiotic Lactobacillus rhamnosus GG. Appl & Environ Microbiol. 2012;28(7):2337-2344. Mack DR, Ahrne S, Hyde L, Wei S, Hollingsworth MA. Extracellular MUC3 mucin secretion follows adherence of lactobacillus strains to intestinal epithelial cells in vitro. Gut. 2003;52(6):827-833. Isolauri E, Joensuu J, Suomalainen H, Luomala M, Vesikari T. Improved immunogenicity of oral D xRRV reassortant rotavirus vaccine by Lactobacillus casei GG. Vaccine. 1995;13(3):310-312. Malin M, Verronen P, Korhonen H, et al. Dietary therapy with lactobacillus GG, bovine colostrum or bovine immune colostrum in patients with juvenile chronic arthritis: Evaluation of effect on gut defense mechanisms. INFLAMMOPHARMACOLOGY. 1997;5(3):219-236. Kaila M, Isolauri E, Saxelin M, Arvilommi H, Vesikari T. Viable versus inactivated lactobacillus strain GG in acute rotavirus diarrhea. Arch Dis Child. 1995;72(1):51-53. Arvola T, Laiho K, Torkkeli S, et al. Prophylactic lactobacillus GG reduces antibiotic-associated diarrhea in children with respiratory infections: A randomized study. Pediatrics. 1999;104(5):e64. Siitonen S, Vapaatalo H, Salminen S, et al. Effect of Lactobacillus GG yoghurt in prevention of antibiotic associated diarrhea. Ann Med. 1990;22(1):57-59. Gorbach SL, Chang TW, Goldin B. Successful treatment of relapsing clostridium difficile colitis with lactobacillus GG. Lancet. 1987;2(8574):1519. Bennett R, Gorbach S, Goldin B, et al. Treatment of relapsing clostridium difficile diarrhea with lactobacillus GG. Nutrition Today Supplement.1996;31(6):35S. Saxelin M, Lassig A, Karjalainen H, et al. Persistence of probiotic strains in the gastrointestinal tract when administered as capsules, yoghurt, or cheese. Int J Food Microbiol. 2010;144(2):293-300.